Small Amount Of Money From Pink NFL Merchandise Goes To Breast Cancer Research – Business Insider. It’s October and the NFL is once again covered head-to-toe in pink accessories and equipment as part of the league’s Breast Cancer Awareness initiative. While fans can also purchase pink clothing and accessories to support the cause, a shockingly small amount of the fans’ money is actually going towards cancer research. Then consider that only 71.2% of money the ACS receives goes towards research and cancer programs. 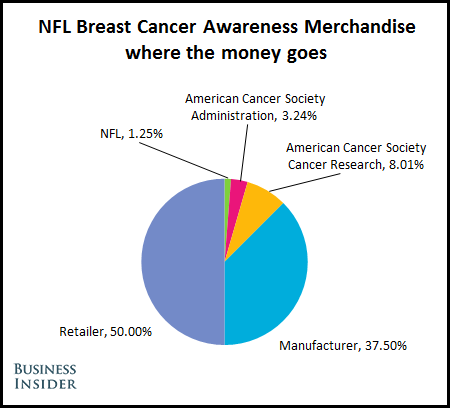 In the end, after everybody has taken their cut, only 8.01% of money spent on pink NFL merchandise is actually going towards cancer research (see right). According to the NFL, any money they take in, that is not donated to ACS, is used to cover the costs of their breast cancer awareness program, “A Crucial Catch.” The NFL also told Business Insider they donated approximately $1 million per year to the ACS in the first three years of the program. Still, there are unanswered questions about where the money is going and who is profiting. The most popular place to purchase pink merchandise is at the NFL’s online shop, official team stores, and at the stadiums. In these cases, the NFL and the individual teams are acting as the retailer. It is unclear how much of the 50% markup for items being sold directly by the NFL and the teams is going to the ACS, if any at all. Of course, in addition to money, the NFL is also raising awareness for breast cancer and it is hard to put a value on that. If fans want to show support for their team and for breast cancer awareness, that is great. But if the point is to actually help fight cancer, fans would have a much bigger impact if they skipped the NFL and donated directly to the ACS or other organizations working to fight cancer.